One doesn't venture long into the study of Japanese history before encountering the expression "Tenpô Reforms", words which have huge import in the study of ukiyo-e as well. Tenpô is an historical period running from 1830 to 1843, near the end of which, in an attempt to slow down consumer spending and improve government finances, the Shogunate promulgated a series of reactionary laws. 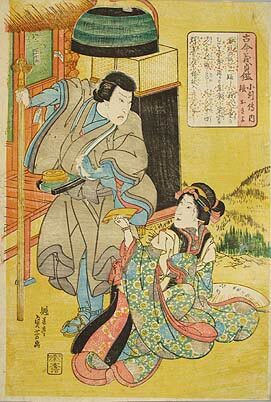 One of the numerous misguided sumptuary edicts from this time ended all production of actor and geisha prints — though not warrior prints because they were seen as morally uplifting — and for a period of five years (1842-47) the ban was strictly enforced. This was a disastrous blow to the ukiyo-e print world, especially in Osaka which specialized in kabuki prints. By 1847, when publishers in the second city started to test the government's resolve by tentatively issuing prints again — laws are rarely removed from the books in Japan; enforcement just quietly lapses — the market had changed and many of the brilliant artists of the 1830s had lost their spirit or retired. Osaka ukiyo-e was never to recover anything like its former glory, and as if to symbolize the reduced status from here on out most prints were made one-half their pre-Tenpô size. Figs. 1 and 2 help demonstrate the effect of the reforms. Fig. 1 from c. 1840 depicts a scene from a kabuki play by the Osaka artist Utagawa Sadayoshi, (active 1837-53). 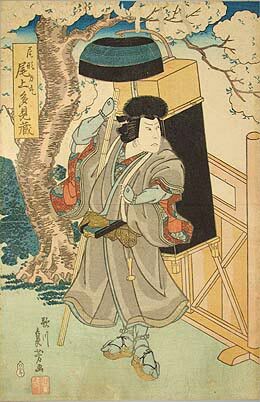 A typical pre-Reform print, the actor's name (Onoe Tamizô) and the role (Ogata Rikimaru, carrying a portable Buddhist shrine on a pilgrimage) appear prominently in the box in the upper left-hand corner. The lower left corner has Sadayoshi's signature and decorative red seal, and — in the small gourd — the name of the publisher, Wataki. Impossible to see in the photo but very indicative of pre-Reform is the heavy paper stock that allows for blind embossing of the cherry blossoms and liberal use of metallics and rich, saturated pigments (in the obi and under-kimono areas that peek out from under the austere priest-like garb). By way of contrast, examine Fig 2, which is also by Sadayoshi but from c. l848. Though not half-size, this print has immediate post-Reform written all over it. Instead of the actors' names, the pink colophon in the upper right sports the title "Tales of Chivalry and Loyalty from the Past and Present," while the rest of the box goes on to state how the print is giving the public an example of an edifying, model pilgrimage. That this was hokum was known to everyone. The face of the pilgrim was unmistakably that of the celebrated kabuki actor Kataoka Gado, and the fact that the print represented a specific scene from a specific play (a different pilgrimage play than in Fig. 1) was also clear. Somehow, however, in true Japanese fashion, the letter of the law was being fulfilled. Unfortunately, the subterfuge is not the only thing about the print that is transparent. So is the paper, a grade far inferior to pre-reform, and so are the cheap pigments. A minimal number of blocks were carved and the printing is slapdash. The publisher Honsei, testing the waters after five years of suppression, was wary of further baiting the authorities by using luxurious processes. The result is a look and feel vastly different than before: better than no ukiyo-e production at all, but only slightly. Within a few years printing improved and eventually actor names re-appeared on prints, but ukiyo-e were never again as good. The Tenpô Reforms may have been temporary, but not the repercussions of those edicts in the history of prints. This article originally appeared in Daruma, no. 20, Autumn 1998. Copyrighted © text and pictures reprinted with permission.